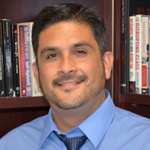 Dr. Pedro Olvera, Psy.D., L.E.P., is the director and associate professor of the School Psychology program at Azusa Pacific University (APU). He teaches coursework in the area of assessment of ELL students, cognitive assessment, and enhancing collaboration with Latino families. Before joining APU, Dr. Olvera was a bilingual school psychologist in Santa Ana, CA. He maintains a private practice with his wife where Dr.Olvera is frequently called upon to offer his expertise in matters related to the assessment of ELL students. For more information about Dr. Olvera, we invite you to visit…. Ms. Nadia Villapudua M.S., L.E.P., is a Special Education Manager for the Oxnard School District. Before moving into administation, Nadia was a school psychologist for the Conejo Valley Unified School District as well as Rio School District. Nadia began her career in education at LAUSD as a special education assistant, before serving three years as a special education teacher. A former LEP/ELL student herself, Nadia is deeply committed to improving outcomes for bilingual students.